This is the plum’s little sister! Its name originates some 2000 years ago from the Plum of Damascus from where it came from. It is a wild plum and is naturally sweet and the shrub is thornless too so not a painful experience collecting the fruits. Plums are again rich in vitamin C which helps boost the immune system. They also contain sorbitol which helps regulate the digestive system,meme it’s use as a laxative!!! 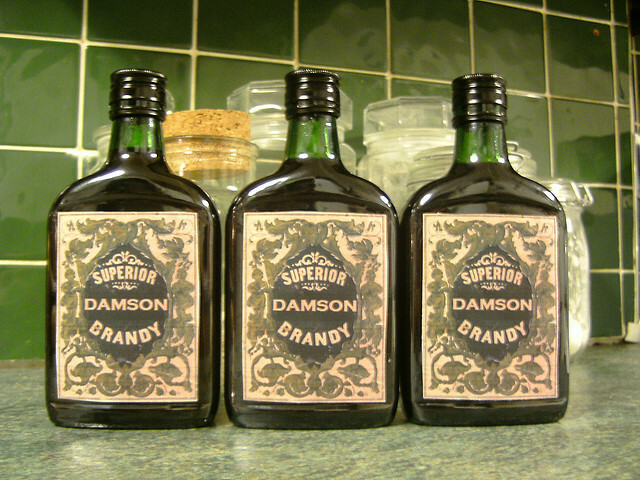 Damsons are a blue-black plum about the size of unshelled almonds; not really a fruit bowl fruit, they lend themselves to cooking – as jams and jelly, crumbles and cobblers or in my case, for making wonderfully fragrant, heady liqueurs. This is an interesting and simple liqueur to make and does not require any special equipment. Clean and dry the damsons before freezing to crack skin or prick with a fork. 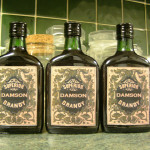 Add the damsons and sugar to a sterilised jar, pour in the brandy and shake vigorously. Keep in a dark & cool place, shake daily for 1 week then shake weekly for 3 months. Decant the liqueur into bottles and enjoy. There is a body of mainly anecdotal evidence that damsons were used in the British dye and cloth manufacturing industries in the 18th and 19th centuries, with examples occurring in every major damson-growing area.